This is Wayback Wednesday, your midweek blast from the past! In this feature, we dig into the archives, look back at the history of basketball gaming, and indulge in some nostalgia. Check in every Wednesday for retrospectives and other features on older versions of NBA Live, NBA 2K, and old school basketball video games in general. You’ll also find old NLSC editorials re-published with added commentary, and other flashback content. 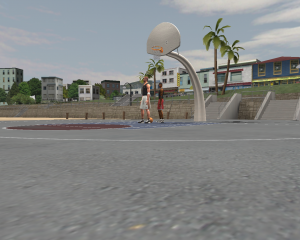 This week, I’m taking a look back at the 1-on-1 courts that were available in NBA Live 2003. 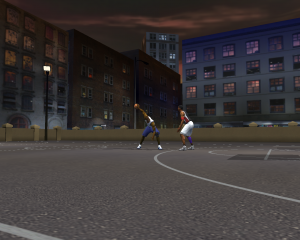 When 1-on-1 mode was implemented in NBA Live 2000, the games took place on the same urban street court that was featured in Practice mode. This approach continued through NBA Live 2002, though EA Sports changed up the aesthetic of the courts a little in each game. 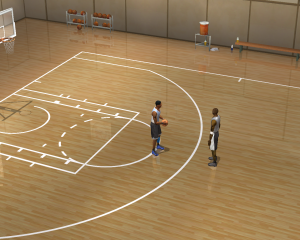 Come NBA Live 2003, the decision was made to have Practice mode take place within a generic gym. While merely a cosmetic change without any added functionality, it was arguably a more suitable setting, giving the impression of a player shooting around in their team’s practice facility. The urban court is a familiar weathered blacktop, with a grey steel backboard and chain net. The high chain link fences from the previous urban courts are gone, with the court now surrounded by a low cement wall. Taking a look beyond the wall, you’ll see several apartment buildings, a couple of high rises, and a row of stores: Hanson Electronics, the Coral Cafe, a newsstand, and an all-night grocer. A phone booth and newspaper vending machine can be found near some park benches. Bleachers have been placed on the sideline, in view of the broadcast camera. It’s the quintessential urban setting, with ambient traffic sounds and other city noise. Long shadows and a dusky sky confirm that the players are hitting the court in the late afternoon, and that the basket they’re shooting at is located at the western end of the court. Lights in the corners of the surrounding wall illuminate the court, making it possible to play well into the night. The lighting effects obviously seem primitive by modern standards, but they’re quite impressive for 2002, setting the scene very well. It’s clear that the art team wanted to make the environments for their 1-on-1 courts detailed and appealing, and their efforts are readily apparent once you start looking around in instant replay. It’s a definite step up over its predecessors. Conceptually speaking, I think it was a good idea to make the urban court the default choice for 1-on-1 mode. It continues the approach established in previous games, in turn providing a familiar setting. It also immediately distinguishes 1-on-1 mode from Practice, especially as the latter does not offer a choice of courts to shoot around on. Defaulting to the urban court for 1-on-1 mode suggests a scenario where a couple of NBA players have headed down to a local park for some pickup games. Given the popularity of NBA Street, as well as the street courts in recent NBA Live and NBA 2K games, I’d suggest the setting captured an atmosphere that is still popular today. It may seem a little boring compared to the urban court with its downtown aesthetic, but the practice gym is still an appealing setting. As a generic team practice facility, the only branding you’ll find are NBA Live 2003 banners hanging on the walls. Racks of basketballs stand off to the side, along with a bench, a cooler, and several water bottles. Bleachers are set up on the opposite side of the court, behind the camera when playing on a broadcast angle. There’s a non-functioning scoreboard, a mezzanine is located above the bleachers, and several large windows adorn the upper walls of the building. The windows and lights hanging from the ceiling ensure the gym is well lit. Looking out the windows, you’ll notice that the facility is surrounded by tall trees, and the sky looks a little overcast. That may suggest why the players have decided to play at the practice gym today, with the weather making the urban court a little hazardous. The court itself is immaculate, with freshly painted lines, buffed hardwood, and the regulation NBA backboard and stanchion. Its panelled walls aren’t as interesting a sight as a downtown landscape, but the attention to detail is still impressive. You’ll also notice that the lighting is different from the urban court, as the shadows of the players, ball, and backboard are being cast from the overhead lights. As I mentioned, the gym is a great professional-looking setting for Practice mode, a facility where professional players would go to train and put up shots. It became the template for a lot of the practice courts that would be featured in subsequent NBA Live games. The Hangar even uses a few similar design concepts, which is one of the reasons I was able to create a suitable NBA Live 08 mod based on it. It’s a setting that implies players going head-to-head after team practice, or meeting up to work on their game in a comfortable facility behind closed doors. Sure, it lacks the atmosphere of the urban court, but it’s a good design, and a suitable venue for 1-on-1 games. 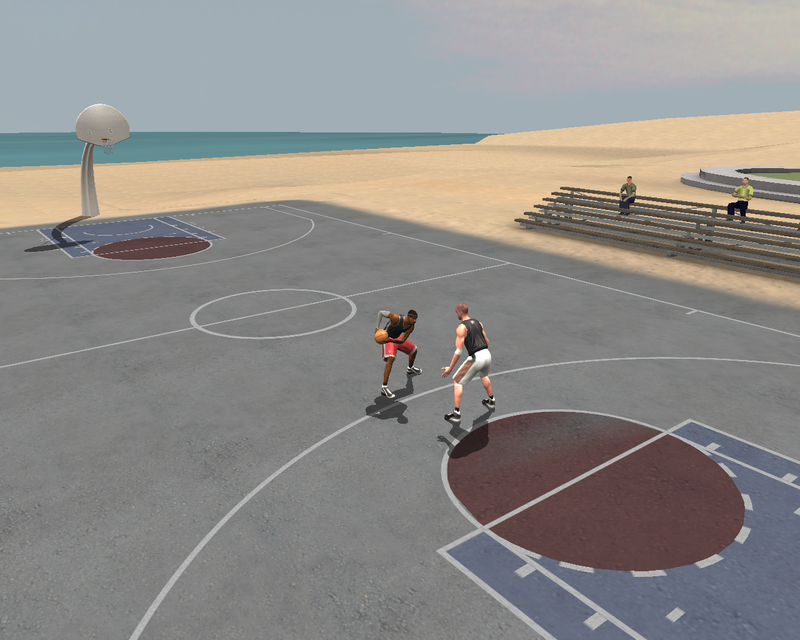 Of all the 1-on-1 courts in NBA Live 2003, the beach court arguably stands out the most. 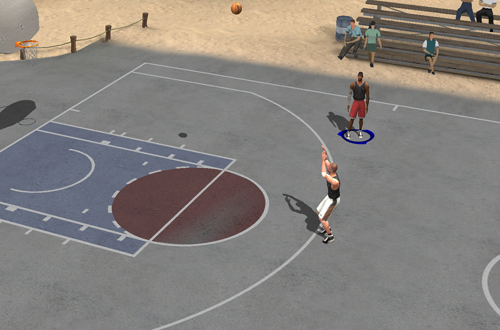 Located beachside, it’s the only one of the three 1-on-1 courts that features a painted key. The backboards are unique, being fan-shaped rather than rectangular as with the urban and practice courts, and they’re held up by a different stanchion. It shares the chain nets found on the urban court, though the blacktop has a different colour and texture, with hints of sand being blown or walked onto the surface. Indeed, the sand touches the court on three of its sides. The bleachers are located on both sides of the court for beachgoers who feel like taking in a few 1-on-1 games. Games are taking place at midday, as the shadows are being cast from overhead. If you take a look around in instant replay, you’ll see that a lot of work has gone into the details of the surrounding area. At one end, you’ll see the ocean stretching out to the horizon. At the other, stairs lead up to a promenade where palm trees are growing. Beyond that is a street where you can see a restaurant, market, and several apartment buildings in the distance. It’s a vastly different aesthetic to the grittier downtown street court, but it demonstrates the same impressive attention to detail. Although we’re unable to explore any further, there’s the illusion of a town beyond what we can see. We’re also treated to the sounds of the beach and the ocean during play on the court, which gives it a distinctly different atmosphere to the urban and gym venues. The beach court is not only noteworthy because of its unique setting, but sadly also its absence in later games. 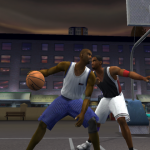 It only appears in NBA Live 2003, with future games only offering the urban and practice courts, until the urban court was also removed in the PC, PlayStation 2, and Xbox versions of NBA Live 07. Nevertheless, it remains one of the most memorable venues and artistic accomplishments in the history of the NBA Live series. If you dust off NBA Live 2003, it’s worth checking out. 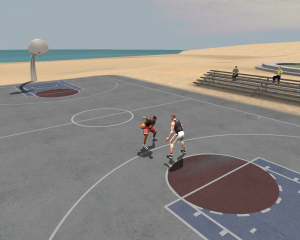 It’s easy to look back at the selection of three 1-on-1 courts in NBA Live 2003 and bemoan the absence of the feature in later games; it certainly does stand as a prime example of content and options that have been lost over the years. However, they also deserve to be remembered fondly, and as a positive step for the NBA Live series. After all, they’re an early example of the NBA Live art team going above and beyond in terms of creating additional content. There wouldn’t have been many complaints if the game had only included one venue, but the team still took the time to create three distinct settings for 1-on-1 play, sprucing up a mode that otherwise wasn’t a priority. In that regard, I think it’s fair to say that their efforts and attention to detail turned out to be indicative of their later projects. 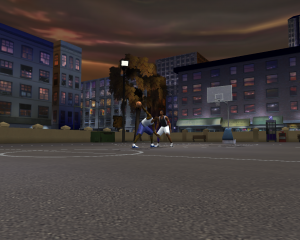 Consider the efforts that the team behind NBA Street Homecourt went to in order to painstakingly re-create all the featured street courts to the last detail. We’re now seeing a similar approach with the current NBA Live games beginning with the Pro-Am courts in NBA Live 18, and expanding even further with all the international locations planned for NBA Live 19. 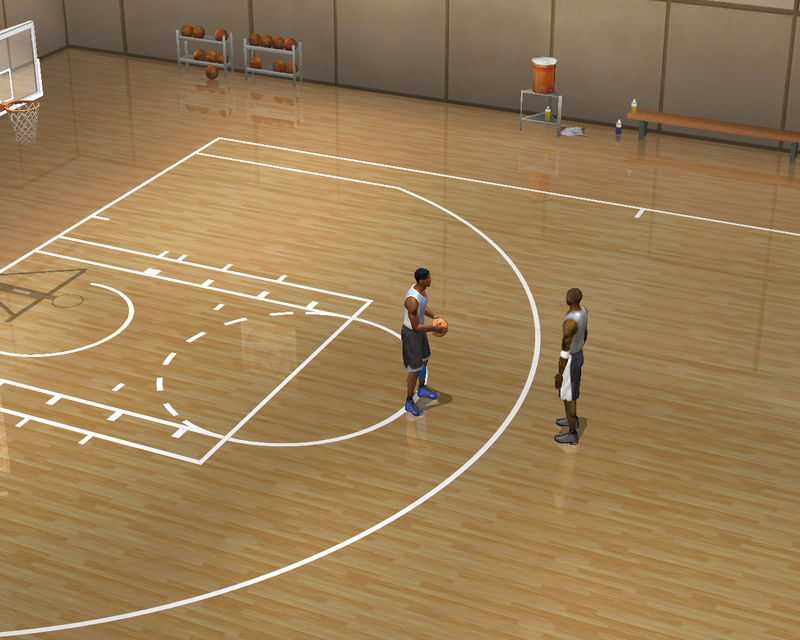 Those original 1-on-1 courts may have been generic, unnamed locations, but they were clearly inspired by venues EA Sports are now featuring in their long-running basketball series. 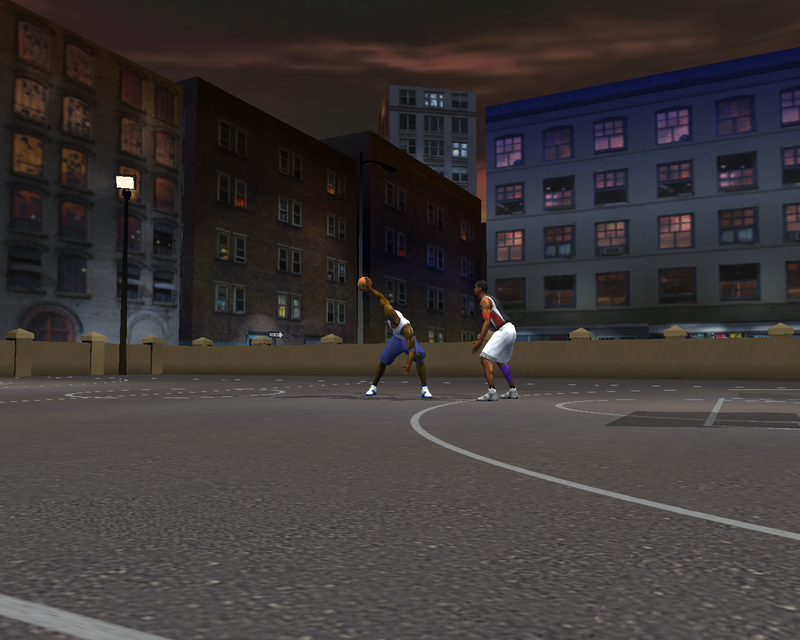 While it can be difficult to appreciate the graphics of games from a few generations ago, and younger gamers may wonder what the fuss is all about, I can’t help but be impressed when I look back at these courts in NBA Live 2003. The textures may not be high resolution and it’s definitely a product of its era, but the overall attention to detail – not just the courts but everything beyond them – is absolutely tremendous. The aim was to give each of those courts their own look and atmosphere, and I would say that EA definitely succeeded. It was something special for NBA Live 2003, and a sign of things to come in terms of detailed locations beyond the NBA hardwood. Good read! thanks for the content.